Since TFS first came out it has been easy to create an automated build solution based on the TFS services. With Visual Studio 2010 it also became easier to create an on-premises continuous deployment solution using the new Lab Management component in TFS. With Visual Studio 2012 there are several improvments which further improves the build-deploy-test scenarios together with the introduction of hosted TFS services for those interested in a cloud based ALM solution. Recently Microsoft announced a very sleek solution to enable continuous integration to Azure using the hosted Team Foundation Service. Mike Fourie has written about Using Continuous Deployment to Azure with Team Foundation Service that is a great start if you are interested in Azure deployment. But what about projects not using Azure? It sure sounds nice to have the option to host the entire development infrastructure in the cloud. So in this post I want to show how we can use the new features in Visual Studio 2012 to build a complete continuous deployment solution using Visual Studio 2012 and cloud services. The Team Foundation Service (tfspreview.com) is used to manage code and build assets. Windows Azure is used to host virtual machines that we compose to a test lab. 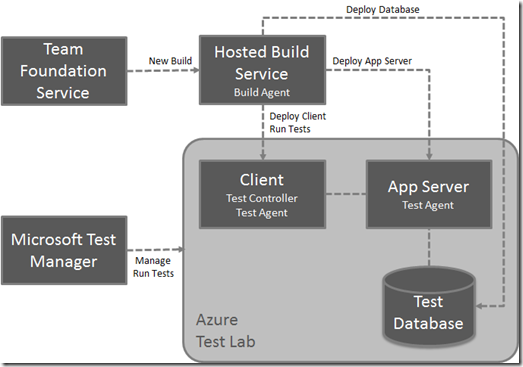 Microsoft Test Manager (MTM) is used to create lab environments and to run tests on the lab environment in Azure. The Hosted Build Service runs the builds, including the lab management builds. As part of the lab management build process the hosted build controller will deploy a build to the test lab and run automated tests on the lab. So the questions now is how much work is needed to get this up and running? Let’s go and implement the core components of this vision and see for ourselves! The Team Foundation Service is TFS in the cloud. It’s currently available for free in a preview form but the service has been running for a while now and is very stable. Go to www.tfspreview.com to read more about the service and to create an account. Since the Team Foundation Service is a hosted service the configuration we need to make is minimal for our scenario, just create an account, create a project and add the code. A build service is currenty an integrated part of every Team Foundation Service account. This may of course change once the service is commercially available but for now it’s there for free. Brian Harry has a great post that describes how to setup and use the hosted build service here: http://blogs.msdn.com/b/bharry/archive/2012/03/27/announcing-a-build-service-for-team-foundation-service.aspx. This means we don’t have to do anything to get builds working with the Team Foundation Service. So with the TFS infrastructure solved we now need to create a lab machine (or more) to run our tests on. For this example I created a simple Windows Azure worker role and enabled remote desktop in order to be able to log on to the machine to configure it and to install additional software as needed. The Team Foundation Service comes with an integrated build service but unfortunately not a test controller. We need a test controller to be able to setup a Visual Studio 2012 Lab Environment and also to control the test runs in the remote environment. We can install the test controller wherever we want as long as it can access TFS and the lab machines. A simple solution for this scenario is to install the Test Controller on the lab machine itself. I used RDP to connect to the VM and then downloaded and installed the Test Agent directly on the Azure machine. Note: It’s generally not recommended to install the Test Controller inside a Lab Management environment so you should setup a dedicated machine for this purpose. Visual Studio 2012 has a great enhancement to the way we create Lab Management envioronments; it is not required to install the System Center Virtual Machine Manager to create a lab instead we can build one from any physical or virtual machine. So in this case we will create a lab environment from the Azure VM created earlier. With the test controller configured as described in the previous step we can now use MTM and create a new environment. The most interesting parts for our scenario is the Machines tab where we specify the Azure machines (getting the hostname for the VM is probably the most challenging part) and also an account on the VM that has permissions to configure the environment. The next interesting configuration is the Advanced tab. Here we need to specify the test controller the environment should be connected to. We can also configure the environment to run UI tests and if so provide the account the test agent should be run under. Take a look at the following guide if you want more information on how to setup a Lab Management environment with Azure machines: How to get VS11 Lab Management to work with Azure VM Roles and Azure Connect. Next we need to create a TFS build to compile a version of our project that we can deploy to our test lab and use for testing. Setting up a TFS build to create a deployment package can be very simple or quite a challenge depending on what kind of application we have. We will just assume we have a TFS build called ExpenseIT Dev that creates a deployment package for us. The build has only one different thing in the hosted build scenario and ther is where the build is dropped. With the hosted build service we can choose to drop the build in TFS, something that makes sense in a cloud scenario where we don’t have access to a file share. If you want to learn more about creating automated builds with TFS 2012 then The Visual Studio ALM Rangers TFS Build Customization Guide is a great resource. Continuous Deployment requires more than just an automated build and deployment process to work. We also need a way to verify that the deployment actually works and what better than to do so by using automated tests built into the process?! First we create a new build definition using the LabDefaultTemplate11.xaml process template. Next we specify which build to deploy. We use the ExpenseIT Dev build and use the <Latest> available build. Note: we cannot Queue a new build option together with the hosted build service because currently we are only assigned one build agent per account. The logic in the LabDefaultTemplate11.xaml build template is to queue a new build and wait for it to complete before running the deploy and test stages. With only one agent this workflow will be blocked and eventually timeout. That’s it! We have now set up a complete build-deploy-test workflow using only hosted services! To test the BDT workflow we just make sure we have a build to deploy (the ExpenseIT Dev build) and then queue a new build. As we can see in the build report the application sees the drop folder from the build to deploy in TFS but the activities in the lab workflow doesn’t know how to handle that and instead treats it as a local folder. So to fix this we need to customize the BDT workflow to download the build result so the workflow can find it and use it as expected. To customize the default BDT workflow we just make a copy of it and open up the workflow in Visual Studio. If you want to learn how to customize a build template see the TFS Build Customization Guide. First we will change the deploy and test activites to use a configurable location to find the build result. Then we can extend the deployment script to first download the build result to TFS before performing the deployment tasks. With the build definition using the new build template all that remains is to update the deployment script to download the build result from TFS to a folder on the lab machine. The following script does just this. First we clean the target folders, then create a temporary TFS workspace and download the build result there. Finally the build result files are copied over to the deployment folder and the workspace is removed. That’s it! You have now seen how you can use Visual Studio 2012 with the hosted TFS and Build Service together with Windows Azure VMs to create a complete build lab in the sky. Book Project “Pro Application Lifecycle Management with Visual Studio 2012” Completed! I hope people will find the book valuable, we have tried to make it as practical as possible by having lots of exampels to illustrate the best practices we have learnt from using the product for many years. Oh, and did I mention the book can be pre-ordered? Build Lab in the Sky. First look at using the hosted TFS service with cloud-based build servers and test labs in Windows Azure. Continuous Feedback with Visual Studio 2012. A lap-around the new features in TFS 2012 for providing feedback on the team’s development work.